On Monday, Rachel Arab apologized because years ago some people thought that the Red Indian was worth educating. 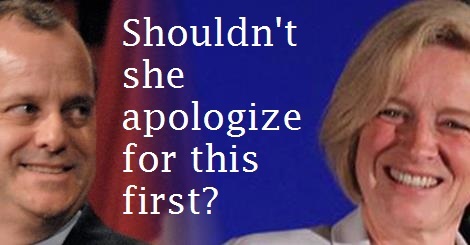 “We want the First Nation, Metis and Inuit people of Alberta to know that we deeply regret the profound harm and damage that occurred to generations of children forced to attend residential schools.” said Notley. FYI, every single word of this statement is a lie. Nobody "regrets" the residential schools, not really. Indians, remember, demanded they be kept open 50 years ago when the possibility of closing them arose. The reason? Because it's a lie when Rachel Arab says there was profound harm and damage done to generations of children. Other than a few isolated cases, there was no damage. But Rachel Arab wasn't done being ludicrous on the subject of the Red Indian. In a speech to the legislature, Notley also added her voice to those calling for a national inquiry into missing and murdered aboriginal women. Look, we've covered this before, and I have more on this coming soon, but there is absolutely zero need of an inquiry, and the NDP are showing their ignorance by thinking there such a need exists. We know why so many Indian women are victims of violence: they hang around high risk peoples. Short of making prostitution highly illegal and punishing the women who sign onto such a dangerous lifestyle, there's not much in practice that can keep Indian women from joining this notoriously dangerous profession. Then outside of turning tricks, the biggest danger to the health of Indian women is that their families and spouses tend to be the most violent and dangerous bunch of savages known to exist in this country: a Red Indian male. Will Rachel Arab fight to ban marriages within Indian tribes to protect these women from the vicious violent men who do more to oppress and destroy them then the most lurid fantasy of "genocidal" residential schools? Will she require Indians remain on the reserve (ie. enforce the treaty) to minimize the risks that occur when they live in inner white cities? No, of course she won't. In other words, she's too politically correct to take any actual action to protect these people. Instead she's just got some cheap political points. She doesn't know the problem, she doesn't know the solution. The only productive thing Rachel Arab can do on this file is shut her mouth.